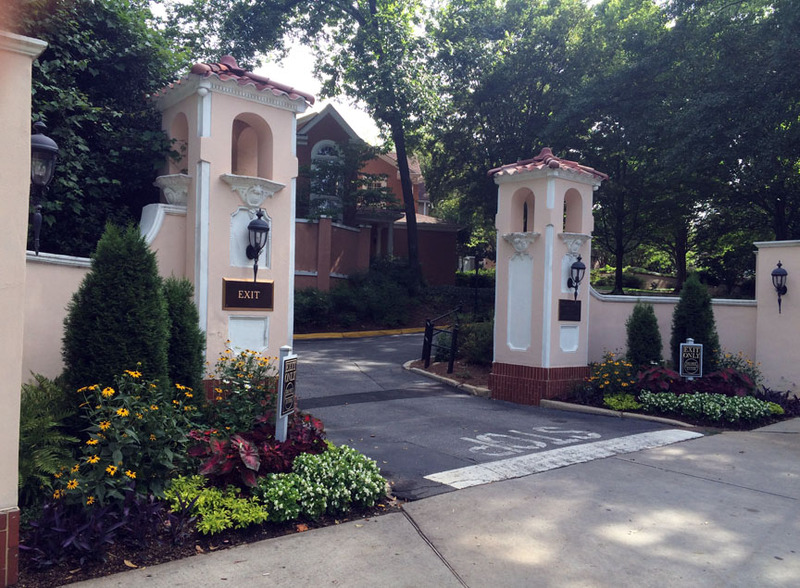 Lullwater Estate has already had a busy summer, with more to come! The biggest news is the turnover in residents, both owners and renters. We have several newcomers to meet and greet, ensuring that everyone is made to feel welcome. Active members are of course important, to keep our community running smoothly. What kind of place would it be, if no volunteers made vital decisions about infrastructure, helped keep our lovely landscape trim and appropriate by choosing the plantings, organized social gatherings, approved changes to exteriors such as decks, made suggestions for new features like our splendid community garden or headed groups like the book club and men's breakfast? These are but a few of the many ways in which neighbors contribute to this lovely place to live. Any history of Lullwater Estate should include the "estate honey" we had one year after honeybees invaded our borders, and the sheep we hired to trim our woodland, both decisions of our board. And the woodland, again thanks to caring residents, continues to regain its form as an attractive spot for strolling, as it was originally. I'd especially like to thank those of you who've sent items for the newsletter. We love to read about your travels, your families, your volunteer efforts, your adventures. Thanks, too, to those who've availed themselves of a place to ask questions and place notices. Together we make a community. The Spring Social at Lullwater Estate was a blast as usual. Some new and familiar faces were seen this year! The food and drink were great and everyone made it home safe. 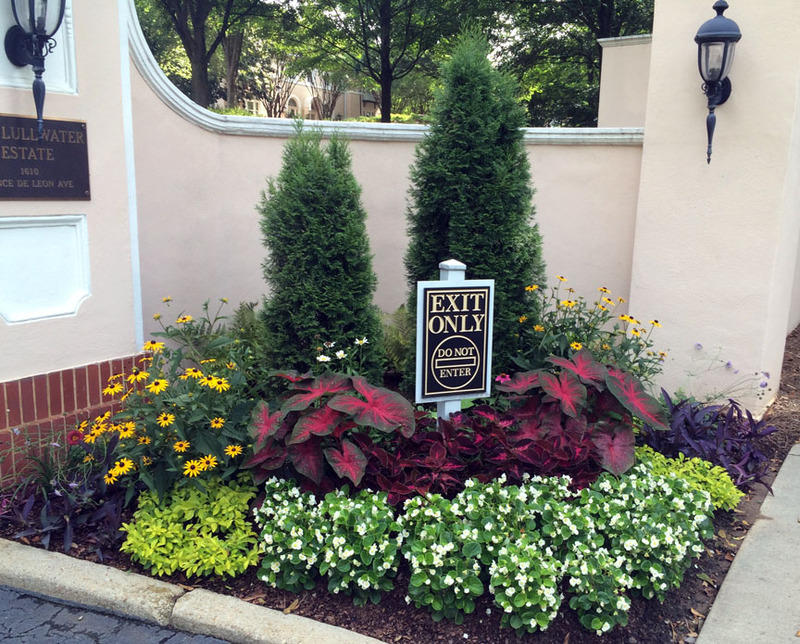 Plus the new summer annual flower beds at our entrance and exit. More on that later. CLICK IMAGES TO ENLARGE! Townhome and Condo living: peculiarities and possibilities. One of the peculiarities of living at The Lullwater Estate is the need for each owner to make sure INSURANCE is in order. The main point is that you need to be satisfied that your insurance covers you for the deductible provided for in the master policy of the Association. An example is water damage. The Association deductible is $5,000. If you want any coverage below this deductible, you would need to have that in your own policy. That leads to the possibilities available to us, to INQUIRE. LEOA has a web site with a Members’ only section, where you will find an explanation of the details of the insurance provisions, a copy of our certificate of insurance, and a form for you to use to send your lender evidence of the insurance. Your unit number is your ID. But you need a Password to get to the Members’ section. 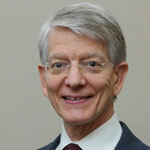 Our resident “keeper of the keys” to the web site is Robert Marshall. In order to get your Password, email him at:rdm@notation.net. Give him your proposed Password, and work it out with him. Then take the next steps to enjoying and participating in this community. At 8:00 a.m. on July 8th, the George Hart Breakfast Club convened as is customary for food and conviviality at the American Roadhouse on N. Highland. 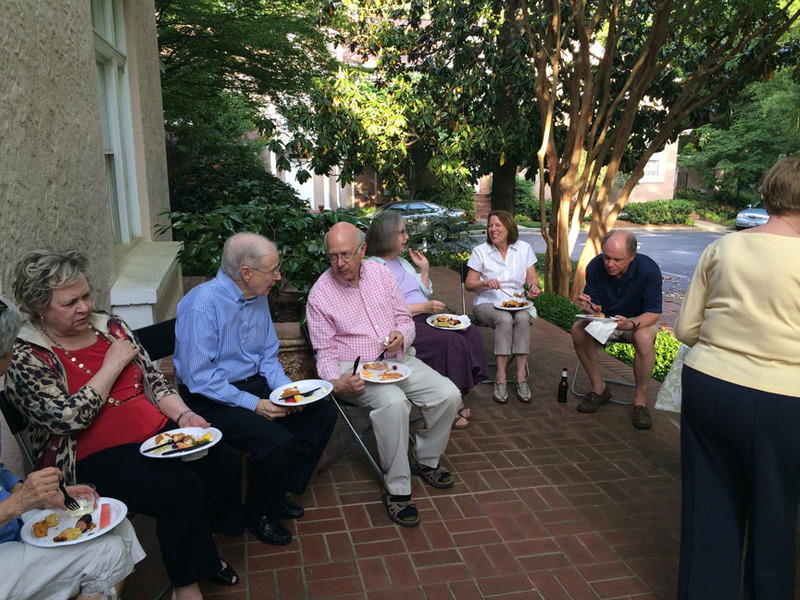 A long kitchen wait allowed protracted conversation. 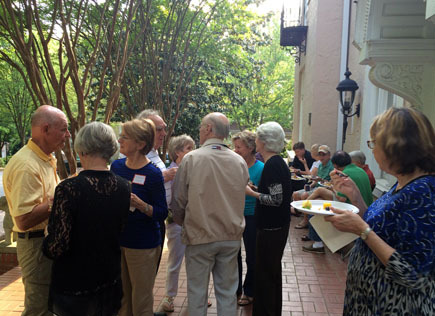 Several attendees had recently returned from travels, and the subject of cruising came up, a term with a whole different meaning for older men rather than younger ones. The next regular biweekly meeting will be July 22nd at the same time and place. The usual suspects are expected to attend. For more information, contact Hilton Fuller. A number of units at the Lullwater Estate have recently sold and we have a host of new neighbors to welcome to our community. Dave Castulik moved into unit 6 in the Mansion at the end of July and is enjoying the built-in stairmaster he climbs every time he comes home! Dave is originally from St. Louis and comes to the Lullwater Estate via Boston and, most recently, Midtown. Liz Salinas is the new tenant in #11 after that unit was purchased by an investor LLC in January. Liz brought a yummy gazpacho to the porch party in May and says she is happy to live in such a beautiful part of the city. 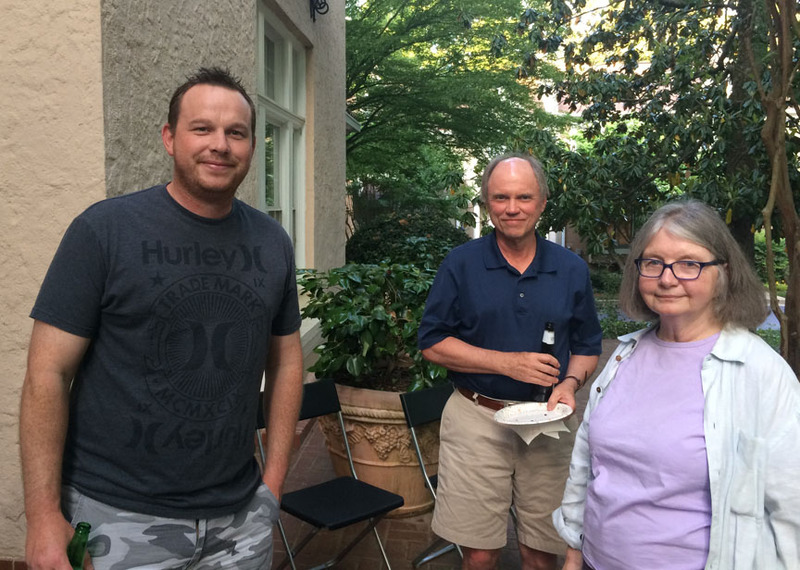 Tom Hemby is the new head-of-household at #12 since his mom, June, moved to Arbor Terrace in Decatur in May. Tom works at Georgia Power downtown. Joe Lappan moved into #17 in June, unpacked and immediately headed back to East Asia for a couple weeks where he recently lived and worked for Coca-Cola. Joe is eager to get settled in to his new place and begin enjoying the neighborhood. Sarah and David Kruse, from Beloit, Wisconsin, have moved to #19. David has been with a company in Lawrenceville for some time, but they have just now been able to make Georgia their residence. Their puggle “London” came with them and is sure to enjoy their walled garden as well as the wonderful dog-walking areas in the neighborhood. Mom-and-daughter pair Earline and Terri McCormick are new renters in #42, which sold in January. Coming from Chicago, their goal was to be closer to family in Florida and Atlanta was as close as Terri’s company could get her. They are happy to be here and Terri is already enjoying a bit of horticulture in front of their new home. 737 Lullwater Road is still on the market. The Welcome Committee makes an effort to greet new residents soon after they arrive. A packet of information about our community is provided (trash pick-up schedules, parking & pet rules, insurance information, a recent directory), along with scones or home-baked cookies. That doesn’t substitute for neighborliness from all of us, so please reach out to these new folks and let them know they’re welcome! 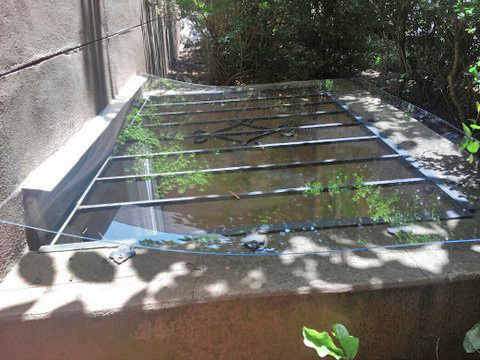 Window Wells - A Mixed Blessing! In ten years at Lullwater Estate we have noticed two frogs and one cat in our front window well. Ever try to catch a frog? They are elusive even in enclosed spaces. We recently returned from our four month Texas exile to find a very dejected cat down there. Someone had stuck in long boards presumably to aid escape, but that evidently didn't help. We opened the (painted shut) window and the pathway out through the garage. The creature seemed dazed and not inclined to move but finally - to our relief - it did. Later we determined that it had been there at least a week. Nine lives, indeed! Musta used a few that week! There was a lot of nasty wet rotten pine straw in there, blown in by the yard crew. Removed all that and ran a fan for days. I suppose any solution to this problem will require the approval of the architectural committee, but we bought a temporary solution (attachment), and went out for quotes on large clear plastic domes. First responder quoted $535 and then we requested volume pricing in case others want one. The best solution seems to be a sort of cage or dome over the window well, and responses to Don's query elicited the reduced volume prices of $382 apiece if five of us ordered them, and $366 each if ten placed orders. This compares very favorably with the original price! The Isaacs at #27 have plenty to report this summer! They've started a new business, called Knock Music House, knockmusichouse.com. They do music camps and programs for recording, etc, You can find more about their offerings on the website. The address is 1052 St. Charles Ave in the alley across the street from Hand in Hand, next to the back parking lot of Glamour Paws. Its a great space and so much fun! Mia, already "famous" around here for appearing at Horizon Theater and making a video, booked her very first commercial. It was her second audition and according to her mom, "She nailed it." It's a back to school commercial for Belk. She also signed with J Pervis Talent Agency. "She is on her way to the top," says Simone. The family is very excited about these developments, and look forward to seeing what comes next! 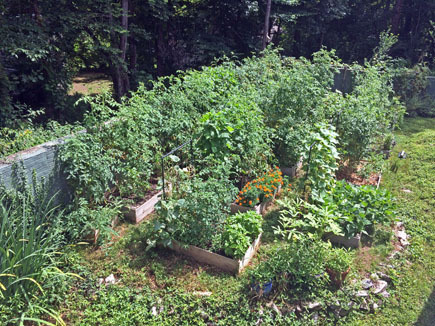 The community garden is thriving better this year than any other year. 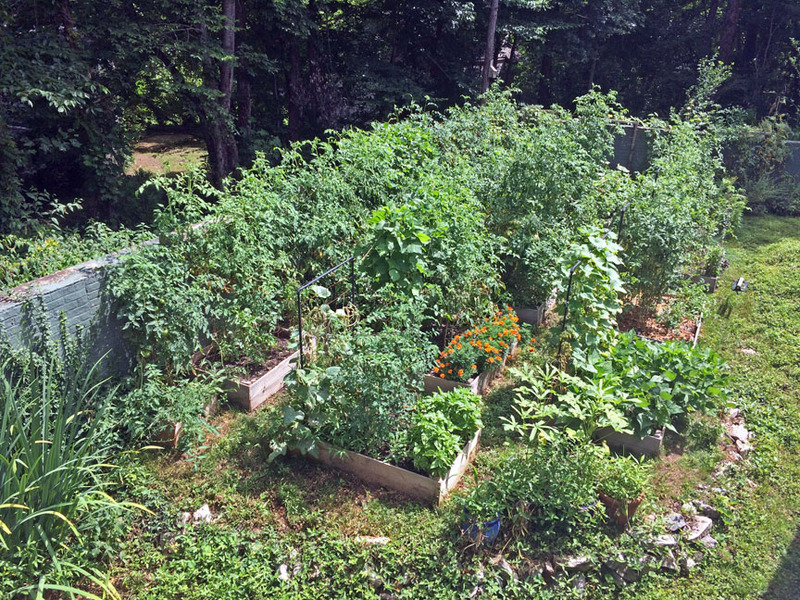 Part of this success is because members installed an automatic watering system that utilizes the well water. Every other day, starting at 6:00 am, sprinklers water the area for 20 minutes. Can't get much easier than that! This year members have planted tomatoes, cucumbers, green beans, peppers of all kinds, basil, okra, cilantro, leeks, parsley, and even asparagus! Everything is in full bloom now, so make sure you take a stroll down to see. Members this year include Jamie Ciomperlik (Chair), Lynn Hart, Ken and Jan Yancey, Robert and Georgia Marshall, Kathy Radde, Michael Plemmons, and Carolyn Johnson. The Landscaping Committee recommended, and the Board approved, hiring a company whose sole responsibility will be maintaining the summer and winter flower beds. After receiving several bids, we settled on a company called Color Burst. 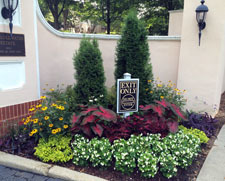 Since 1987, Color Burst has designed eye-catching, unique flower beds for thousands of commercial and residential properties throughout the Southeast. Our package includes enhanced maintenance and an early autumn enhancement. Not only will the flower beds be properly maintained, but we also get fresh flowers when these begin to wilt in late August. Having visited in Germany on the way, I was over jet lag and arrived in Riga, Latvia, excited and ready to go. Atlantan co-travelers Meg, Jim and Carol were also on the flight from Frankfurt, so we piled in a taxi for the short ride to the Hotel Jurmala, our assembly point for Chuck and Betsy’s guided Baltics trip. Dinner at Uzbekistan, an aptly named restaurant with exotically spiced offerings, was a portent of culinary delights to come. Seeing a pair of swans in the bay that night, riding the ripples close to shore, sticks in my mind. Beach hangouts were opening for the evening. The sky was a pale blue at 11 PM. Having a good night’s sleep on this trip would entail carefully closing the black-out curtains. Next morning at breakfast was time to get acquainted. Gail, Clark, Paula, and my roommate Marcia rounded out the group. On a walking tour of residential Jurmala, a quiet neighborhood of mostly restored frame summer residences, lilacs still bloomed. 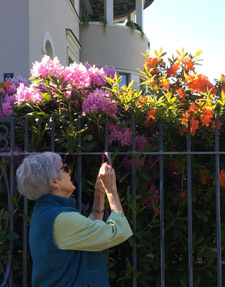 Rhododendrons showed forth, part of the horticultural abundance we would find compressed into the short Baltic growing season. Back at the hotel, we met Andrejs, our driver. The grumpy Russian Latvian glowered at us as we boarded our van (thoughts of the Cold War). Chuck, the closest we came to a translator, took on the task of making clear to Andrejs where to drive. Tough duty, but soon we were enjoying red poppies flowering in the wheat fields. En route to Kuldiga, we stopped at the first of many picturesque eateries. A shallow horseshoe waterfall spanned the river. Plost Krogs (The Ferry Pub) served simple food and cold beer on a sunny porch. Atlanta appetites seeking the local specialty celebrated Chanterelle mushroom soup. Finding the Kuldiga weavers’ shop proved difficult, but the textile enthusiasts were dogged and Andrejs kept driving. We finally found the weavers’ temporary shop (permanent building being restored). Great rejoicing as we observed the women working hand looms, then ooh-ed and ah-ed and bought goods. We thanked Andrejs for zigzagging the van all over Kuldiga; Cold War began a slight thaw. We found out Andrejs has a family – shopkeeper wife, son 13, daughter 6. Smiling, he showed us their pictures on his I-Pad. The lovely seaside resort of Nida on the Curonian Spit has quaint wooden houses and shops, some topped with weathervanes carved to identify the family who resided there in days gone by. I began to think about a weathervane souvenir, one sized as a Christmas ornament. Andrejs suggested additional stops on the way back to the ferry, including a heron rookery, lively on this late afternoon. Cold War over? Next day we left Klaipeda for the lively city of Kaunas, and Carol surprised me with a weathervane souvenir she had found at a Klaipeda market. Perfect for the Christmas tree. What a thoughtful travel buddy! We also visited Rumsiskes, an ethnographic museum of villages created from old rural wooden homes. While there, wouldn’t you know it? (shades of Atlanta these days), a film crew and costumed actors were lounging about. Heading north from Kaunus, we turned off to Ninth Fort, location of a former Nazi concentration camp. It featured an impressive Soviet sculpture on the hill where 50,000 people were exterminated by the Nazis. We recalled the intense sorrows of World War II. The Hill of Crosses, a site of resistance in Soviet times, was our next stop. Back in Latvia, our next lodging was Mezotne manor house, whose current owners have lavished attention and funds to restore this gracious home. Friday morning we crossed the bridge into Old Town Riga, where the annual Grass Fair was underway. A temporary stage featured lively traditionally garbed dancers- with instruments, songs and a festive atmosphere. The coffee house nearby had rich pastries and outdoor seating. Booths in the square and down side streets offered textile items, jewelry, and handmade toys. Northern winters must bring residents to really appreciate summer. Riga’s Occupation Museum was a sobering experience, along with news from home of the killing of 9 people Wednesday at a Charleston SC, AME church. I was aware of the fragility of goodness and ready for a quiet time in my room. For dinner the much anticipated Aragats did not disappoint. Ludmilla, cared for us well. To start, we had a Georgian white wine, eggplant two ways and a beautiful packet of flaky pastry with soft cheese inside. Then a dish of chopped lamb and vegetables with a nice Georgian red. Dessert was fresh strawberries and ice cream, beautifully presented and appropriately light; lastly, mint tea. Next day in the van, my birthday, I was feted with song and locally found gifts; sweet. We traveled through the countryside to a lovely eighteenth century frame manor house, Ungurmuiza, which interested me more than Rundale Palace. The wooden walls were painted with landscapes and figures. Behind the house, a large plank swing hung from an old tree near rabbit hutches, a small orchard and a garden. Staff bustled about preparing for a wedding, as they might have done a century ago. It must have been a joy to live in that house, especially for children. Back on the bus, I was surprised by Andrejs, now everyone’s old friend, with a bouquet of flowers – bright blue cornflowers, white daisies, red poppies. What Cold War? On our last full day in Riga, we went to the city market housed in 5 zeppelin hangers rescued from oblivion to make wonderful high ceilinged venues for selling vegetables, meat, live fish and other local goods. It caters mainly to the local market, including chefs. At the hotel, we readied for early departures in the morning, then walked to neighborhood restaurant Cemodans (The Suitcase). Staff were incredibly gracious, service impeccable, and good food well presented. Time passed quickly, however, and we knew we would be late to bed this last night in Riga. It was a measure of the entire trip that we nevertheless stretched out our enjoyment of the entire evening. The Literary Ladies of the Lullwater Estate Book Club have been free-lancing this summer, with no meetings planned until autumn, and a nice list of recommendations shared by members. Most recently, they read All the Light We Cannot See, a WWII tale interweaving the lives of a blind French girl and a young German soldier, both teenagers. With beautifully drawn settings and well portrayed characters, the story is engrossing and bittersweet. The group is open to any woman residing at Lullwater Estate, and when meetings resume an announcement will be made. 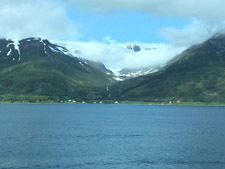 When Chuck and Betsy Marvin and Lynn Hart discovered that Norway appeared on both their bucket lists, as they had planned already to be in northern Europe together, they started looking at travel websites, especially the Hurtigruten cruises along the western coast of the mountainous country. This company began with small boats carrying mail and other necessities to the little villages, many of which were accessible only from the water. 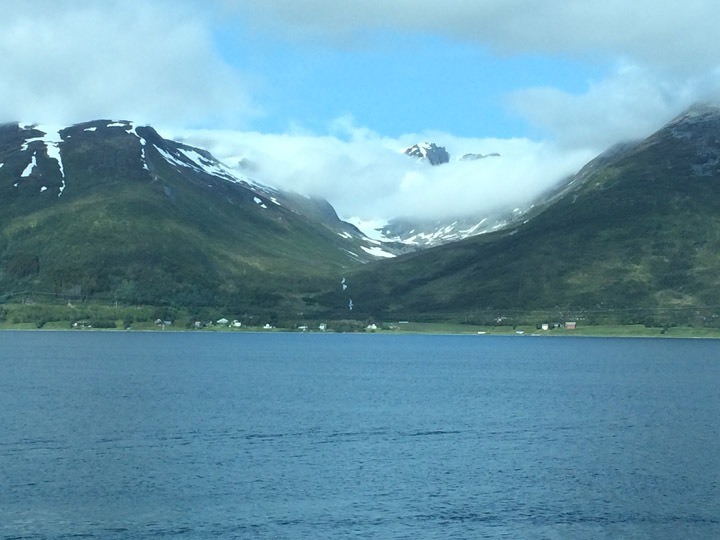 Nowadays it's turned into a big cruise business, each ship carrying several hundred fiord-seeking tourists. For Chuck, Betsy and Lynn, along with Lynn's younger daughter Susan, this sounded appealing, so they booked a four-night deal to visit the spectacular scenery and a few towns along the way, up to Tromso, over 200 miles north of the Arctic Circle. First they spent several days in Oslo, visiting the castle, the famous Vigeland sculpture park, and other attractions, before boarding the train to ride over the mountains to Bergen. 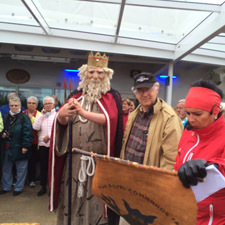 The old town, its historic seaport and fishing heritage, and four-building art museum entertained the Harts and Marvins for a few days, until time to get on the ship. They all enjoyed going out to the summer home of the composer Grieg to hear a piano concert late one afternoon. The vessel was ingeniously designed with several lounges and spaces for sitting and simply watching the lovely fiords, villages and mountains drift by, but stops and day trips to landmarks along the way enlivened their time. A competition for guessing the exact time (to the second) we'd cross the Arctic Circle drew our special attention when Chuck won it, guessing only five seconds off! His "prize" was a surprise stuffing of ice cubes down his neck, followed by a shot of cloud-berry wine. 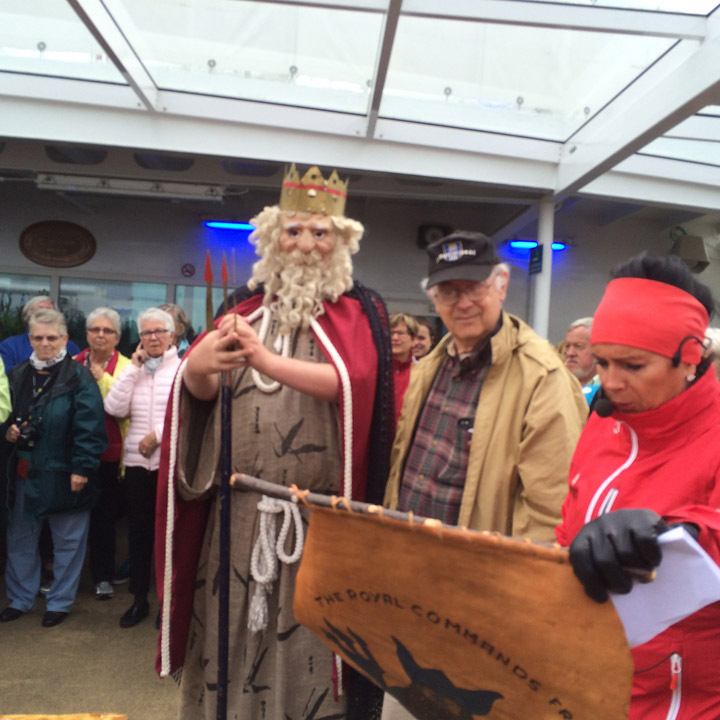 The ship's captain then presented him with a Hurtigruten flag. They disembarked at Tromso, from which they'd fly to Oslo, then Frankfurt and home. Betsy and Chuck stayed two extra days in the town, where it never gets dark at this time of year. Lynn, Susan and Chuck went up a funicular for a bird's eye view of Tromso, and then to a concert at the modern Arctic Cathedral, where they heard music for organ, cello and soprano. 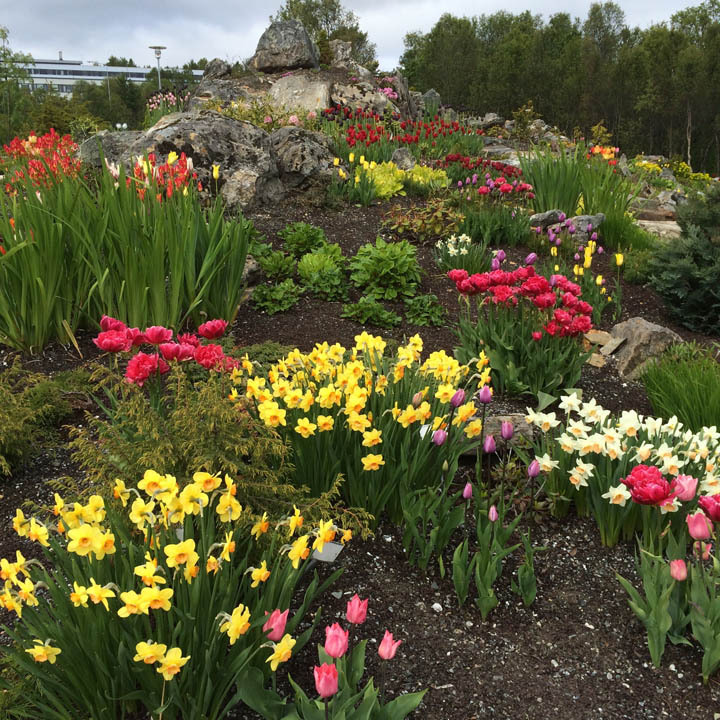 The highlight for Betsy was a visit to the "northernmost botanic garden in the world," where daffodils, many varieties of tulips, and blue Himalayn poppies were just blooming. An organ concert that afternoon in the old church was most enjoyable, too. They never saw the actual "midnight sun," as it was cloudy much of the time, but found the northern ambience very pleasant. No trips there are planned for winter, though. The editors would like to thank Don Kenagy, the Landscaping Committee, Shirley Hollberg, Lynn Hart, Chuck Marvin, and Simone Isaac for contributing to this newsletter. 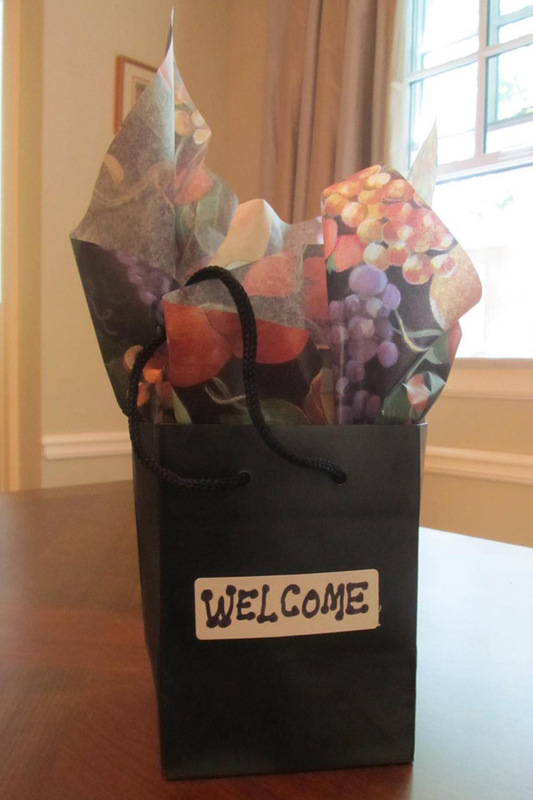 We welcome items from all residents, anytime.